Eight species of Eimeria and one of Isospora infect pigs in North America. Piglets 5–15 days old are characteristically infected with only I suis, which produces enteritis and diarrhea. These agents must be differentiated from viruses, bacteria, and helminths that also cause scours in neonatal pigs. Coccidiosis is caused by small parasites called coccidia that live and multiply inside the host cells, mainly in the intestinal tract. There are three types, Eimeria, Isospora and Cryptosporidia. Disease is common and widespread in sucking piglets and occasionally in pigs up to 15 weeks of age. Diarrhea is the main clinical sign. I suis is prevalent in neonatal pigs. Infection is characterized by a watery or greasy diarrhea, usually yellowish to white and foul smelling. Piglets may appear weak, dehydrated, and undersized; weight gains are depressed, and sometimes piglets die. A contributing factor to mortality is that piglets become covered with diarrheic feces and stay damp. Oocysts are usually shed in the feces and can be identified by their size, shape, and sporulation characteristics; however, in peracute infections, diagnosis must be based on finding stages of the parasite in impression smears or histologic sections of the small intestine, because pigs can die before oocysts are formed. In severely affected piglets, histologic lesions confined to the jejunum and ileum are characterized by villous atrophy, blunting of villi, focal ulceration, and fibrinonecrotic enteritis with parasite stages in epithelial cells. Preventive control by feeding anticoccidials to sows from 2 wk before farrowing through lactation or to neonatal pigs from birth to weaning has been reported; however, effectiveness of the latter has not been confirmed. Although the sow is a logical source of infection for piglets, this has not been well documented. Thorough removal of feces and disinfection of farrowing facilities between litters greatly decreases infection. Piglets that recover from infection are highly resistant to reinfection. Although less commonly associated with clinical coccidiosis, E debliecki, E neodebliecki, E scabra, and E spinosa have been found in pigs ~1–3 mo old with diarrhea. Illness may last 7–10 days, with pigs remaining unthrifty. Treatment of coccidiosis may include sulfamethazine in drinking water. The control of coccidiosis in newborn piglets infected with I suis has been unreliable. The use of coccidiostats in the feed of the sow for several days or a few weeks before and after farrowing has been recommended and used in the field, but the results are variable. Amprolium and monensin are ineffective for prevention of experimental coccidiosis in piglets. A control program designed to decrease the number of oocysts has been recommended and consists of proper cleaning, disinfection, and steam cleaning of the farrowing housing. Amprolium (25% feed grade) at the rate of 10 kg/tonne of sows' feed started 1 wk before farrowing and continued until the piglets are 3 wk of age has been recommended, but the results are unsatisfactory. A single dose of toltrazuril (20 mg/kg, PO) decreased oocyst excretion, the incidence of diarrhea, and weight gain impairment in piglets with experimentally induced coccidiosis. Diclazuril (5 mg/kg) is being investigated as an oral anticoccidial in piglets. The symptoms of Coccidiosis in pet pigs are similar to those of the bacterial infection E. coli. But Coccidiosis is in fact not a bacterium like E. coli but a parasite (worm) that infects cells in the intestinal tract. The parasite damages the walls of the pig's intestines, and usually secondary bacterial and/or viral infections also develop, and it is these that often kill the pig. Coccidiosis can be diagnosed as three different types of Coccidiosis parasites called Isospora, Eimeria and Cryptosporidia. It is contagious but is usually only seen in piglets and occasionally in boars that have been moved into an infected pen that was not properly sanitized. It is in fact the sows that are the carriers of the parasite and they pass it along to the piglets, most often through their feces if the pens are not cleaned daily. Some breeders have the veterinarian treat sows before they become pregnant, as a preventative measure. It is important to take good care of your pigs and keep your pig breeding area scrupulously clean so that this type of parasite does not infect your piglets. Unfortunately this parasite is not easily killed and does not respond well to antibiotics. Prevention is really the only cure, because once symptoms are seen there not much to be done. You should still contact your veterinarian, however, as he may have a new treatment or advice that may help. Coccidiosis shows up in piglets at about a week and a half to three weeks old. Its symptom is diarrhea. The piglet's stool will be of varying degrees of yellow to yellow-grey, green, to rust colored depending upon the severity of the condition. If a piglet has Coccidiosis you will need to move the piglet to a separate area from the other pigs and keep it warm, dry and clean. Provide the piglet with a clean creep area to forage around in. The only effective treatment you can offer is to give the piglet as much electrolyte fluid as you can. The parasite is not easily killed and the piglet most likely will have to fight it off with its own immune system. Piglets that get this parasite often simply waste away and die of dehydration. 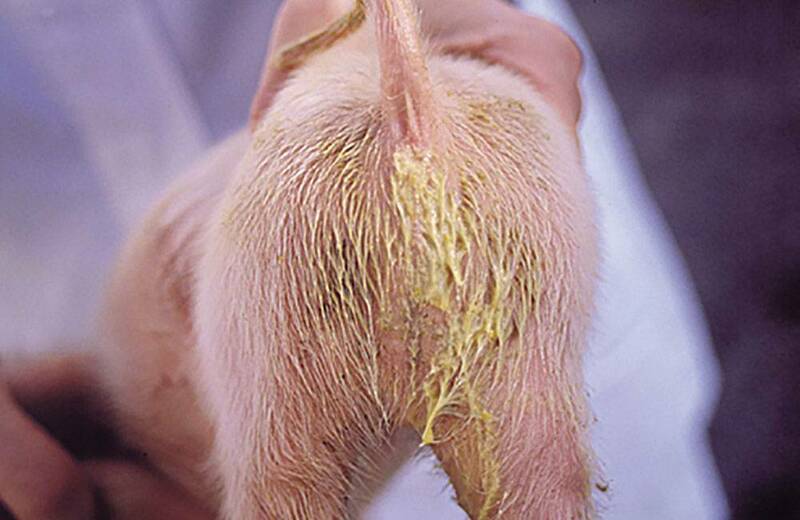 Piglets that get this disease have usually been penned in unsanitary conditions where the pen is not often cleaned. Proper cleaning and hygiene is critical to keeping your pig healthy, especially when they are young. Coccidiosis infection is a direct result of poor cleaning and hygiene. the floor until the piglets are at least three weeks old. No animal in captivity should be made to live in its own feces - including a pig.